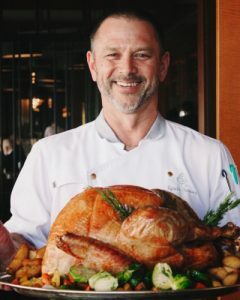 High above Market Street in downtown San Francisco, the team at Four Seasons Hotel San Francisco is preparing for the holidays with festive feasts at MKT Restaurant – Bar. At Four Seasons Hotel San Francisco, which has over 380 employees from all over the world, the team draws on nostalgic moments from their childhood to shape some of the experiences and dishes guests will enjoy at the hotel and MKT Restaurant-Bar this holiday season. Guests will soon gather at the restaurant for Thanksgiving, Christmas and New Year’s Eve special menus, creating new memories as they ring in the New Year. Four Seasons Hotel San Francisco welcomes its youngest VIPs this holiday season. Upon making a reservation, the concierge team can help personalise a stay or set-up surprises for children. During check-in throughout December 2018, holiday bites and sips such as stollen, hot chocolate and mulled wine, will welcome guests. “Glühwein (mulled wine) smells delicious and nothing warms you up quicker than a large mug with steaming glühwein!” – Daniela Koch, Director of Rooms.